We would like to find out whether people receiving care at home have a voice. We’re currently gathering experiences from paid carers and feedback from people who receive paid-for care in their own home. 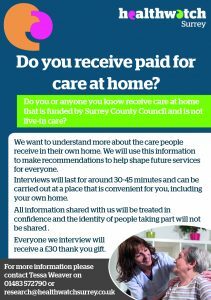 We’re especially interested in people who receive daily visits and people whose care is funded by Surrey County Council (SCC). 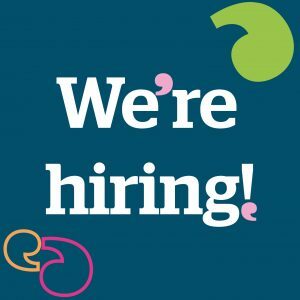 Join our thriving team of VOLUNTEERS! Interested in health and social care. Keen to ensure people in their community can have a say in how health and social care services are run. Outgoing, good listeners and enjoy talking to people. In November 2018, we received a detailed response to our report from Surrey Mental Health CCG Collaboratives and Surrey County Council, the commissioners of mental health services for Surrey. The commissioners thanked Healthwatch Surrey for our report, "It is always valuable to receive independent reports so we can be well informed and take action on the issues that are important to people." To view the full report, click here. 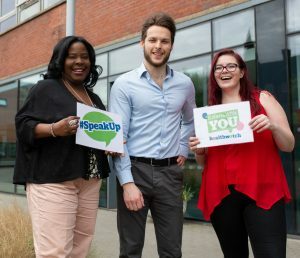 Healthwatch Surrey has set out to answer the question 'In Surrey, do Domiciliary Care Users have a voice?'. During phase one of our project, we spoke to 13 care agencies, asking them about their compliments, complaints and comments procedures. From this, we have reported many key findings and raised some important questions that we will be looking into in phase two of the project. To view the Phase 1 report, please click here.